This is the most lofty of all of my adventure goals at the moment. It's the one big thing that I've been working towards and the thing that nearly all of my current adventures contribute to. Hiking the John Muir Trail (known as the JMT) from Yosemite National Park to Mt. Whitney (14,496ft) has been a dream of Jesse's and mine for the past several years. It's a 215mi backpacking trek that takes a ton of prep, purchases, and training to do. We've been slowly purchasing and collecting gear over the years and now we've moved into the training phase. If we keep up our current activities, I'm hoping we'll be on the John Muir Trail by the summer of 2018! Whitney Portal Road heading toward Mt. Whitney. Mt. Whitney is another hike that's years in the making for Jesse and I. Mostly because we never felt fit enough to tackle it and we've also been nervous about doing an overnight in such a rugged environment. But hiking Whitney will literally be fantastic prep for the JMT since it's literally the finish line of the 215mi trail. The craziest thing about tackling Whitney is the elevation and carrying 40-50lbs on your back. But I know we can do it and I'm starting to feel ready to take it on. My two biggest goals this summer were to do my first backpacking overnight (which I completed! Post on that coming soon!) and hike the 6 pack of peaks. I've currently completed 2 of the 6 peaks and hope to be finished with all of them by mid-September! These peaks are notoriously fantastic training for the JMT, so Jesse and I have been hiking our butts off and tackling these suckers. These peaks are no joke!! Confession time: I've never been to Joshua Tree National Park! I know, pretty crazy considering it's literally the closest National Park to my house. Firstly, I'm more of a mountains & trees kind of gall, and secondly, it always seems to be so gosh darn hot whenever I feel like going. Truth be told I've never actually made Joshua Tree a priority. I've driven by the entrance to the park and have even camped overnight a few miles away, but I have yet to explore the inside of the park. So this October I'm making it a priority to finally make it out to JT. I also want to try and hone in my astro photography skills and what better place to give that a try than Joshua Tree? I never paid much attention to the Trans Catalina Trail until recently when I read a lot of people do it as a warm-up for the JMT. It's a stunning 30mi trail along Catalina Island (an island off the coast of Los Angeles) that gives you the opportunity to practice several overnights without any real wildlife (read: no bears!). It's also a much lesser traveled section of the island and a chance to experience Catalina in a way that most people probably never will. I read that the TCT is best experienced fall - spring, so I'm going to keep in on my radar for this winter 2017 and spring 2018. I've actually always wanted to go to Death Valley, but just haven't made it out there yet. There's so many wild things to see and places to experience - it's like an alien world that both terrifies and excites me. Terrified because I'm afraid of the insane temperatures, and also have a fear of breaking down in the middle of the desert without cell reception. Excited because the sunsets are stunning and the terrain is really wild looking. It feels like we've had a crazy heat wave in Los Angeles since March, so I've been rightfully putting off a visit to Death Valley until it feels safe to go. I'm hoping I'll get the chance this winter or spring 2018. The Lost Coast Trail has been earning some traction in my hiking Facebook Groups recently and has definitely been on my radar since I first heard of it several years ago. It's a 25mi hike along a section of the coast in Northern California that was deemed too steep and rugged to build a road. The entire hike takes place along the beach and requires hiking through sand, on wet stones, and schedule flexibility based on the tide. It's a totally different experience from most of the thru-hikes in the world and will definitely take some prep and research in figuring out how to get there. I don't have a particular time I want to have this hike completed by - it may be before or after the JMT. But either way, I just want to hike the Lost Coast Trail within the next year or two! 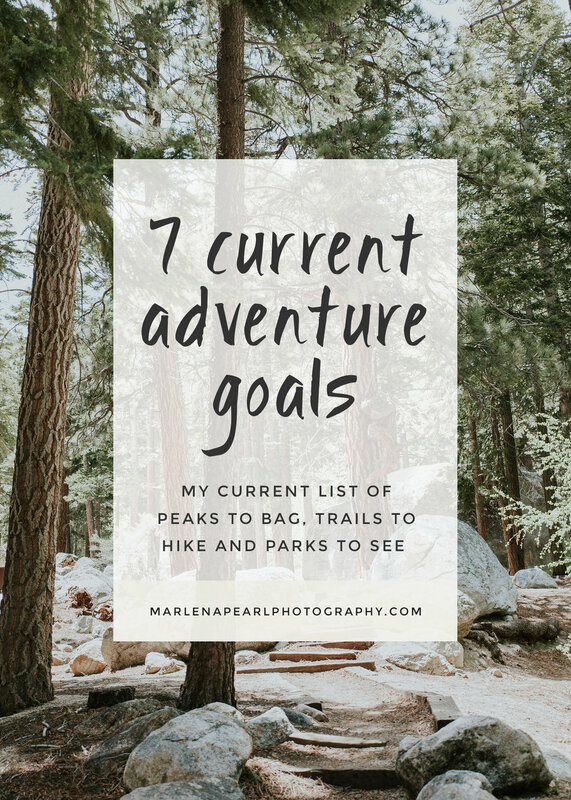 What are your current adventure goals? Do you have any tips for me to achieve mine?